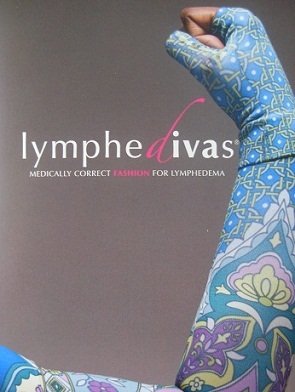 LympheDIVAs – Medically Correct Fashion for Lymphedema, A Product Review & Giveaway! Are you a man or woman living with lymphedema or do you care about someone who is? Are you concerned about developing lymphedema following your breast cancer surgery or radiation treatment? Do you dread donning your drab beige-colored lymphedema sleeve or gauntlet when you garden, exercise or get on an airplane? If you answered yes, keep reading and enter my giveaway for a chance to win an amazing product I know you will love! Lymphedema occurs when there is an accumulation of lymphatic fluid in body tissue causing swelling, most commonly in the arms and legs. Primary lymphedema develops when there are missing or impaired lymphatic vessels. It can be present at birth or develop later on well into adulthood. Secondary lymphedema sometimes develops as a result of radiation, injury, infection or as a side effect of cancer surgery, especially surgeries in which lymph nodes are removed. It can develop days, weeks or even years after surgery. All the causes of lymphedema are not fully understood. There are precautionary measures one can take to hopefully prevent lymphedema. You can read about such measures here. 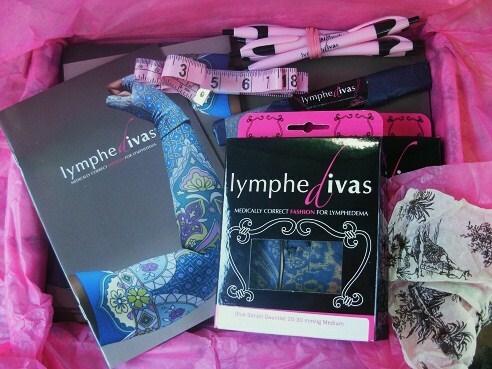 If a medically approved compression sleeve and/or gauntlet has been recommended or prescribed for you as part of your plan to prevent or manage lymphedema, I would love to introduce you to LympheDIVAs, a fabulous company with a fabulous product. I was first made aware of LympheDIVAs via friend and fellow blogger, Jan Hasak, who wrote an amazing guest post called, Musings From a Lymphedema Lady, for Nancy’s Point last summer. Jan’s post is packed full of information, so be sure to check it out. Jan has the condition herself and has devoted vast amounts of her personal time and energy advocating on behalf of lymphedema patients. 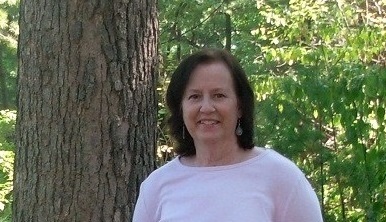 To learn more about lymphedema and Jan’s advocacy, please visit her blog. The inspiration behind LympheDIVAs arose after two young breast cancer survivors, Rachel Levin Troxell and Robin Miller, both developed lymphedema following their breast cancer treatment, which for both women involved removal of lymph nodes and radiation. Unsatisfied with the prescribed drab bandage-like beige sleeves available to them, Rachel and Robin decided to do something about it. After considerable research, collaboration and effort the company, LympheDIVAs, was founded. It has been dedicated ever since to offering women and men as well, compression sleeves that are more comfortable as well as more stylish. It’s heartbreaking to add that Rachel’s cancer recurred and she passed away from breast cancer in 2008 at the age of 37, but her dream and her company live on. LympheDIVAs carries on Rachel’s vision and dedication to helping others who are attempting to prevent or who are actively managing lymphedema. This is truly a company with a heart and soul that genuinely cares not only about the products it sells, but also about the women (and men) who wear it. I quickly discovered it is also a company that offers fantastic and friendly customer service and who doesn’t love that? After being asked to write a review, I was generously provided with a sleeve and gauntlet set to personally try out. My palm, wrist, forearm and upper arm measurements were all carefully collected and analyzed to ensure my personalized proper fit. Next came the hard part, choosing the style I wanted to try out. Here are just a couple of examples from their varied and stunning collection. I am a casual jeans kind of gal, so ultimately I decided on the Blue Bandit set because of its “denimy” appeal for me. When my box arrived mere days after I made my selection, I was thrilled when I opened it. While most mail order companies send you their product wrapped up in a plastic bag and shipped in a plain cardboard box or wrapped up in yet more plastic, this is not the way LympheDIVAs ships! Pretty great presentation wouldn’t you say? Inside the box I found my goodies carefully wrapped in colorful tissue paper. It felt as if I was opening a gift instead of something I had ordered for myself. To my surprise, the box contained not only my boxed sleeve and gauntlet set, but also a tape measure, a folder containing extensive measurement information including charts and also important information from the National Lymphedema Network, several colorfully illustrated catalogs, information about LympheDIVAs, free pens, some nail files and last but not least, a customer satisfaction guarantee statement. Later that evening when I tried on my sleeve for hubby, he did a double-take and said, “Wow, what’s that on your arm? It looks like designer tattoos or something! Clearly, I wasn’t the only one impressed. But more importantly, all LympheDIVAs’ products have been carefully designed with the collaboration of physicians, physical therapists, nurses, and nurse practitioners to ensure that customers are wearing products that are medically correct. LympheDIVAs cheerfully and promptly exchanged the sleeve, sending me a new better-fitting one, which I also received just a few days later. Obviously, this kind of friendly customer service is another huge plus when shopping by mail order. While I still cannot honestly say wearing a lymphedema sleeve and gauntlet is something I ever look forward to doing, LympheDIVAs sure makes it a whole lot more stylish, a whole lot more comfortable and whole lot more fun. I’m sort of looking forward to the next time I travel by air and am required to go through TSA. This time when someone looks at me strangely and starts gawking at my sleeve while making some uninformed remark, he/she won’t be calling my new sleeve a bandage behind my back! That will feel nice for a change. Finally, on to the important giveaway information! LympheDIVAs has generously agreed to provide one lucky reader with a free sleeve and gauntlet set of her/his choosing. We all know how expensive medical apparel can be, so this is an amazing value. I hope many of you take advantage of this opportunity. Sign up for yourself, or sign up to win a set for someone else. Sign up today. Leave a comment through Tuesday, July 24, stating you’d like to enter this giveaway. Like always, a comment on my Nancy’s Point facebook page will double your chances to win, but you must first comment here. The winner will be announced shortly thereafter. Be sure to leave your email address so you can be contacted by me, as well as by LympheDIVAs for your personalized fit consultation. I love my new sleeve and gauntlet set and I know you’ll love this product too! And thank you for reading and good luck in the giveaway! Note: Please consult with your doctor or LE therapist before using this or any lymphedema management product. Do you have lymphedema or do you know someone who does? Did your medical team inform you about your risk for developing lymphedema post surgery? Do you have any advice for managing or preventing lymphedema? I would love to enter into your contest. I was recently diagnosed with stage 3c breast cancer, went through 8 rounds of chemo and just had a bilateral mastectomy less than 1 month ago. Radiation is next on my to do list. I am already experiencing axillary webbing and probably will be facing lymphedema in my near future. This sleeve is perfect to make me feel pretty again! Donna, I’m sorry, but this contest is over. You can get the discount through CureDiva though if you type in the Nancy’s Point code. Thanks for reading my review. I would love to be entered in the giveaway. I have lymphedema and was not informed of the risks of getting it post-surgery. One cannot prevent lymphedema, but one can reduce the risk of getting it, according to the National Lymphedema Network. To reduce the risk, wear a garment when flying, don’t lift really heavy loads with the affected limb and avoid injuries to the limb, including bloodwork pokes and blood pressure cuffs. I use this comment as an opportunity to ask your American readers to go to http://www.lymphedematreatmentact.org and send an email to your U.S. Representative through that site to get Congress to pass a bill that requires Medicare to pay for compression garments such as LympheDIVAs to keep lymphedema swelling under control. Right now, Medicare will not pay anything toward these garments, and it’s an utter shame. Thank you!! Jan, This is an older post, so the giveaway is over. Sorry. And thanks for sharing that important link. Lois, Thank you so much for reading and commenting, but the giveaway is over. I’m sorry about any confusion over that. And yes, wearing the sleeves is a pain and they do get expensive, you’re certainly right about that. My best to you. What great information Nancy. Had not heard about lymphadema when I had my breast cancer surgery and have just been diagnosed. So many inspiring women have faced and are facing this. Will also follow-up writing my congressman. Am just beginning to realize the life changes that I will be making. Marjeanne, No one told me about lymphedema and I had never heard of it, so I had no knowledge of it all. There is a lot to learn isn’t there? Good luck with things. Hope you’re doing alright. And thanks for the compliment too. Welcome to Nancy’s Point. Hope to hear from you again. How can i become a representative for LymphDiva? I am already a certified adjuster for compression garments and would like to add this line of garments to the ones I already have. Mireille, I guess you could contact them and see what happens. Good luck. I would love to win the sleeve and gauntlet. I, too, know Josh Levin, having met him at a National Lymphedema Network conference. His product is so cool. Thanks for bringing the LE issue again to the attention of your readers. My email address is ehasak@yahoo..com. Jan, That particular giveaway is over. Sorry about that. That post still shows up since it’s one of my most commented on posts. Thanks though! Always good to hear from you. I’m just reading the comments and realizing that this contest is over. I’m so bummed. While I have not been officially diagnosed with lymphedema, I’m being fitted for a sleeve tomorrow. I am almost as upset about this as I was my cancer diagnosis (almost). It’s been really hard for me to handle. Anyway, it is what it is, I guess and I’ll try to make the best of it. One of these sleeves will certainly help with that. I have not been diagnosed with Lymphedema, and just deal with swelling, especially on hot days. However, I wonder about “preventive wear,” particularly on planes. What does anyone know, or read, or observed about that? Maggie, There isn’t necessarily agreement here within the medical community. If in doubt, seek the advice of your doctor and/or a LE specialist and then you will need to figure out and do what you feel is best for you. I do wear a sleeve when flying as directed by my LE therapist a few years ago. This is a preventive measure at this point. 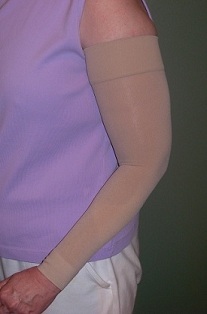 The sleeves are the same, whether preventative or for diagnosed lymphedema. However, if you deal with some arm swelling on the side where you had lymph nodes removed (even just on hot days), then you likely have a mild case of lymphedema. Try to get a referral from your doc to a PT who specializes in lymphedema. I had some mild LE after surgery, mostly above the areas covered by the sleeve (upper back). It’s pretty much resolved, but I always wear my sleeve & gauntlet when flying & try to remember to wear it when working outdoors (sports or yardwork), especially in hot weather. The Lymphedivas sleeves look cool, don’t they? I had preferred one of these Lymphadiva sleeves but was told by my PT that I can’t go with one of them because the gauntlet for the hand isn’t made to come down far enuf on the fingers or at least past rage knuckles between the top of the fingers like the one I had to get. I first had an awful tan colored one and now black. Both I refuse to wear. Bren, I hope you provide LympheDIVAs with your feedback as they do listen and can perhaps find a solution for this issue. Thank you for sharing. I have lymphedema for 14 years after my breast cancer I do have sleeves but they are not colorful.. I would like to have at least two colorful ones. How do I go about ordering them. Angelean, Go to their site, browse and select. http://www.lypmphedivas.com If you need assistance, they offer that. Isn’t a Bikini Parade Just Harmless Summer Fun?